Remember the Supreme Court Decision of “Kelo vs New London“? Washington, D.C.— Today, the U.S. Supreme Court delivered a blow to home and small business owners throughout the country by allowing the government to use eminent domain to take homes so that businesses can make more money off that land and possibly pay more taxes as a result. New London Claimed that condemning the property was part of a larger scaled project called the Fort Trumble Project would serve the common good because the development project would bring lots of money to the community and into the city coffers. Things didn’t quite work out as claimed. Meanwhile, in New London, the Fort Trumbull project has been a dismal failure. After spending close to 80 million in taxpayer money, there has been no new construction whatsoever and the neighborhood is now a barren field. In 2009, Pfizer, the lynchpin of the disastrous economic development plan,announced that it was leaving New London for good, just as its tax breaks are set to expire. As regular readers of this blog know, the redevelopment project that gave rise to the wretched U.S. Supreme Court decision in Kelo v. New London, never came about. In spite of the city’s boasting about the quality of its plans, nothing was ever built on the Fort Trumbull site from which the city displaced an entire unoffending, well maintained lower middle-class neighborhood. Though the formal taking took place in 2000 and the U.S. Supreme Court gave its approval to it in 2005, the city’s project has been a failure, with 91 acres of waterfront property sitting there empty and overgrown by weeds. Now, we learn from the local newspaper, The Day, that following the hurricane Irene, the city has designated the Fort Trumbull redevelopment site as a place to dump vegetation debris. For a video of locals dumping that stuff on the site, click here. 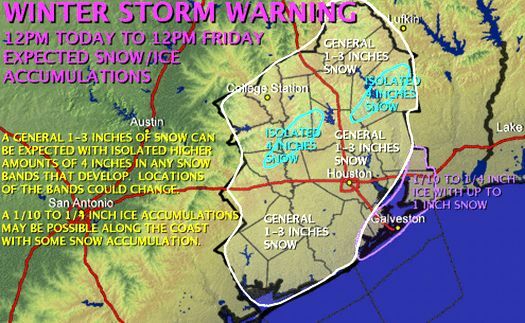 Closer to there was a similar case in Bayport, Texas with similar results. Where a hyphenated Judge screwed a landowner. They invested millions of taxpayer dollars into a never used cruise terminally yet we continue to pay security and maintenance fees for a facility that will likely never be used. At least Fort Trumble is serving some purpose today, The Cruise terminal just sits there. Obama’s one contribution to reducing the size of government begins today with the completion of the last Shuttle Mission. Obama doesn’t like us here in Texas, We are the land of bitter church going gun clingers. We as a state provide 2 recent somewhat conservative presidents and the districts surrounding the Houston NASA facilities sent Tom Delay and Ron Paul to represent us. Today ends America’s manned space program. Huge layoffs that will mark the beginning of a decline in the League City/Clear Lake area as the area joins the rest of the nation in the great Obamian recession. Hurricane Ike bit into the island city’s population in 2008, knocking it from 57,000 to about 48,000. “Our population is going to recover from a bottomed-out low point,” Mayor Joe Jaworski said. He wants to restore the population to 50,000 in one to two years. “My sweet spot is to get it up to 75,000,” he said. I think they need to explain to us why growth is in the voters interest. Is more traffic, and drains strains on our small islands sewage and water resources going to benefit the voter taxpayer and home owner. Personally, I find Galveston more livable after the Ike than it was before. Its cleaner with less traffic, with seemingly less crimes and fewer panhandlers. Its becoming apparent that the city wants to represent the people who are not here yet rather than the voters who already exist. The idea, echoed by others in the community, is to capitalize on the layout of the historic neighborhoods, historic downtown and seashore by making the city greener and pedestrian- and bike-friendly. Jaworski says people are leaving the island for three reasons: a misperception that the schools are poor, the shortage of affordable, attractive housing, and a sense that the city lacks cleanliness and safety. No Joe, you have it all wrong! They are leaving because of the threat of hurricanes and the extremely high cost of wind and flood insurance. While any efforts to improve the quality of lifestyle for us existing residents is much appreciated﻿, Any efforts by the city should be done improve things for those who live here, but not to encourage growth. If we do certain things to improve the lifestyles, growth will likely happen. An unfortunate side effect of an otherwise good thing. Population growth just for the sake of population growth is against the residents best interest. ﻿If we wanted to live in a big bigger city Houston would be most accommodating . We aren’t League City or Clear Lake City and we don’t want to be. There is currently a recall petition to get rid of Joe Jaworski and some of his coherts in the City Council, Probably not a good idea. By contrast, the people who are organizing the drive to recall Jaworski do not seem to have a vision for Galveston’s future — at least not one that most islanders can rally to. Bill Quiroga, who is heading the drive, has offered himself as a candidate for office before. When he ran for mayor in 2010, outlining his vision for Galveston, he received 2 percent of the vote. The votes are in. They will be charging for parking on the seawall. Seawall paid parking will be implemented in accordance with a neighborhood parking and security plan and adhere to state law provisions governing the expenditure of beach user fees. Paid parking will expire seven years from the date the fees are first collected unless otherwise renewed or amended by a majority of qualified voters. This will be troublesome for businesses and their customers along the seawall. Those who provide free parking will be fighting squatters who don’t want to pay. We will go to the polls Saturday, and vote against charging for parking on the seawall. A hairbrain scheme designed to make local government a little bit bigger. When will the city learn, the cure is almost always less government not more. Charging for parking is likely to cause onl;y more problems for businesses near the seawall. How will they keep people from parking in business parking lots and walking across the street? Meanwhile seaweed has taken over the beach, and bureaucracy, not a lack of parking fees, has prevented cleaning it up. 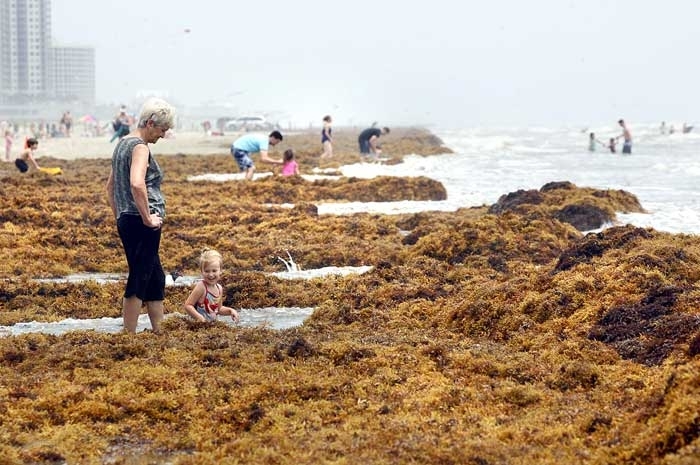 “It’s the most seaweed we’ve had in recent years,” said Mario Rabago, interim executive director of the Galveston Park Board of Trustees. Seaweed usually washes ashore at peak levels from April to September. Cleaning the sargassum has been delayed by new enforcement of a permitting requirement. The city has gra﻿nted a variance to allow for cleaning along the seawall, and Apffel Park should be cleaned by the end of the week. A topographic study of Stewart Beach is needed before a permit can be approved. Meters will not cut the red tape, but may make it harder for some to go to the beach. As State Rep. Eiland speaks, you can almost not even see Steve Mostyn’s lips move. Craig Eiland is fighting tort reform, and is doing a bang up job representing trial lawyers, not so sure how well he is doing representing Galveston and Chambers County. There has been a lot of talk about gambling in Texas, and some folks think that because of the budget crunch and the state Legislators stubbornness on not increasing taxes that legalized gambling would be a source of income that would make every one happy. `tain’t so. While the house committee forwarded a bill. A Texas House committee surprised the casino lobby Friday night when it voted out legislation that would allow video lottery terminals — slot machines — at state racetracks and Indian reservations. The casinos were left behind. Casino interests wanted any legislation approved by the House Licensing and Administrative Procedures Committee to also allow destination casinos in major cities and on the state’s barrier islands. ﻿They want to allow gambling at the horse tracks, but not allow real resort type casinos to be built in the big cities and barrier islands. The bills have split their support, between the the track owners and the casino developers. and have far to go before the Memorial day deadline. While some folks have pined their hopes on gambling being an answer to this budgets crunch. Money wouldn’t come into the state coffers at least until 2013. The legislators would have a hard time seeing that far into the future. Our State Rep Craig Eiland is having anger management issues. Throws the rule book up in the air in frustration, show his great statesmanship skills. Tempers got even testier moments ago when House Calendars Chairman Todd Hunter, R-Corpus Christi wanted to suspend all necessary rules for several controversial bills on Monday’s agenda. Rep. Craig Eiland, D-Galveston, threw the House rule book high into the air to show his disgust. Rep. Trey Martinez Fischer, D-San Antonio, raised his voice from the back microphone – pointing out that Hunter’s extraordinarily unusual motion required one-hour notice. He also reminded Straus that House members took down former House Speaker Tom Craddick, R-Midland, and more than two years ago because of his strong-armed rule. Or that his sugardaddy Steve Mostyn will be disapointed in new TWIA reforms. All I know is that windstorm insurance is a backbreaker here on the island, and they don’t even cover much. Watching the local news we are reminded that it is the end of the world as we knew it. Our tree sculptures are a symbol of recovery to us in Galveston turning our loss into something positive. It was almost 2 years ago on Sept, 13 that Hurricane Ike struck Galveston. The destruction Island wide was devastating. Weeks after the rebuilding we saw some of our majestic oak trees start to die off. Rather than just cut them down folks decided to turn them into art. There are about 30 of the sculptures around town all are within view from sidewalks and the roads. The informal Tree Sculpture Tour has become a popular thing to do on our Island, and the homeowners have been so gracious. The City in its never ending efforts to punish efforts to do good, has assessed a fee of $10.00 to the home owners who tolerate visitors coming by to observe and take pictures in front of their homes. As a sign of recovery and as a sign of the creativity and spirit of humankind, a group of local artists began to sculpt the stumps of the dead trees, creating mermaids, angels and hope from the dying remnants. There are about 20 such sculptures scattered around the city. Three are on public right of way — hence the $10 fee. Beauty always is in the eye of the beholder, but the sculpted trees are beautiful. They have gained worldwide attention on the Internet. The public art is altogether a good and positive thing for a city that still struggles to get its feet back on the ground after a devastating hurricane. For the city to charge homeowners a $10 fee for a sculpture is ridiculous. Nonetheless, the license-to-use fee applies because the tree sculptures are “designed” and thus fall into the category of right-of-way infrastructure. Galveston didn’t see the original trees as right-of-way infrastructure. But the sculptures — well, that’s another matter. Rules, after all, are rules. While Tilloson generously offers to pay the $30.00 for the home owners. I respectfully suggest that in these hard times that if the city is so desperate that they can save a lot more money by eliminating the positions of whoever came up with this decision. When a department comes up with ridiculous ideas, it is a sure sign that there are too many idle minds in one place. The savings would be significantly more than the annoying fees they are subjecting the homeowners too.